For other places to visit, reviews, ratings, and more tourist information, read our Knoxville online tour planner . Washington DC to Knoxville is an approximately 3.5-hour flight. You can also do a combination of subway, bus, and flight; or drive. In July, daytime highs in Knoxville are 87°F, while nighttime lows are 69°F. On the 11th (Thu), you'll travel to Nashville. On the 11th (Thu), take in the history at Stones River National Battlefield, then appreciate the extensive heritage of Bicentennial Capitol Mall State Park, and then glide peacefully along the water with some of the best stand-up paddleboarding in the area. Get ready for a full day of sightseeing on the next day: contemplate the long history of Andrew Jackson's Hermitage, then examine the collection at Lane Motor Museum, then get engrossed in the history at Lotz House Museum, and finally explore the different monuments and memorials at McGavock Confederate Cemetery. To see photos, maps, other places to visit, and more tourist information, refer to the Nashville tour planning tool . Traveling by car from Knoxville to Nashville takes 3 hours. Alternatively, you can take a bus; or fly. Traveling from Knoxville to Nashville, you'll gain 1 hour due to the time zone difference. In July, daytime highs in Nashville are 90°F, while nighttime lows are 70°F. Cap off your sightseeing on the 13th (Sat) early enough to go by car to Memphis. Start off your visit on the 13th (Sat): steep yourself in history at Slave Haven / Burkle Estate Museum, appreciate the history behind National Civil Rights Museum - Lorraine Motel, look for gifts at Memphis Music, then get to know the fascinating history of Beale Street, then contemplate the long history of The Peabody Ducks, and finally steep yourself in history at Sun Studio. Here are some ideas for day two: admire nature's wide array of creatures at Memphis Zoo and then see the interesting displays at Stax Museum of American Soul Music. For other places to visit, ratings, photos, and other tourist information, go to the Memphis travel planner . Traveling by car from Nashville to Memphis takes 3.5 hours. Alternatively, you can take a bus; or fly. In July, daily temperatures in Memphis can reach 91°F, while at night they dip to 74°F. Finish your sightseeing early on the 14th (Sun) to allow enough time to drive to Jackson. Jackson, officially the City of Jackson, is the capital city and largest urban center of the U.S. To find maps, other places to visit, reviews, and more tourist information, go to the Jackson online trip builder . Traveling by car from Memphis to Jackson takes 3.5 hours. Alternatively, you can take a bus; or take a train. Expect a daytime high around 91°F in July, and nighttime lows around 73°F. Wrap up your sightseeing by early afternoon on the 15th (Mon) to allow enough time to drive to New Orleans. Start off your visit on the 15th (Mon): add some adventure to your tour with a kayaking and canoeing tour. To see traveler tips, maps, ratings, and tourist information, you can read our New Orleans journey planner . You can drive from Jackson to New Orleans in 3.5 hours. Other options are to take a train; or fly. While traveling from Jackson, expect a bit cooler days and somewhat warmer nights in New Orleans, ranging from highs of 80°F to lows of 80°F. Wrap up your sightseeing on the 17th (Wed) early enough to travel to Austin. Kick off your visit on the 17th (Wed): explore the fascinating underground world of Inner Space Cavern, then find your balance on the water with some of the best stand-up paddleboarding in the area, and then witness a stunning natural landmark at Barton Springs Pool. Here are some ideas for day two: contemplate the long history of The Driskill and then admire the majestic nature at Pedernales Falls State Park. To find where to stay, maps, reviews, and other tourist information, go to the Austin day trip planner . Getting from New Orleans to Austin by flight takes about 4 hours. Other options: drive; or take a bus. When traveling from New Orleans in July, plan for a bit warmer days and a bit cooler nights in Austin: temperatures range from 98°F by day to 75°F at night. Cap off your sightseeing on the 18th (Thu) early enough to travel to Alamogordo. Alamogordo is the seat of Otero County, New Mexico, United States. On the 19th (Fri), steep yourself in history at Sacramento Mountains Museum, get outside with Trestle Recreation Area, and then appreciate the extensive heritage of New Mexico Rails-to-Trails. Get ready for a full day of sightseeing on the next day: examine the collection at New Mexico Museum of Space History, then take in the dramatic natural features at White Sands National Monument, then see the interesting displays at Shroud Exhibit and Museum, and finally stop by White Sands Trading Company Gift Shop. To find traveler tips, reviews, where to stay, and more tourist information, refer to the Alamogordo tour itinerary maker app . Getting from Austin to Alamogordo by combination of flight and bus takes about 7.5 hours. Other options: do a combination of flight and car; or drive. The time zone difference moving from Central Standard Time (CST) to Mountain Standard Time (MST) is minus 1 hour. Plan for a bit cooler nights when traveling from Austin in July since evenings lows in Alamogordo dip to 67°F. Finish your sightseeing early on the 21st (Sun) to allow enough time to drive to Flagstaff. On the 21st (Sun), contemplate the long history of Riordan Mansion State Historic Park and then take in the exciting artwork at Northern Arizona University. To find ratings, other places to visit, maps, and tourist information, you can read our Flagstaff trip app . You can drive from Alamogordo to Flagstaff in 8.5 hours. Other options are to do a combination of car, flight, and shuttle; or do a combination of bus and flight. In July, Flagstaff is little chillier than Alamogordo - with highs of 81°F and lows of 52°F. Wrap up your sightseeing on the 22nd (Mon) early enough to drive to Page. 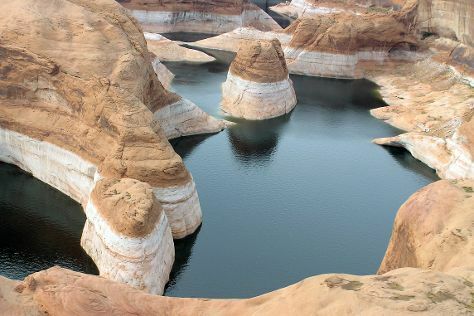 Start off your visit on the 22nd (Mon): explore the striking landscape of Glen Canyon National Recreation Area. On the next day, take in the views from Navajo Bridge, contemplate the waterfront views at Marble Canyon, then explore the striking landscape at Rainbow Bridge National Monument, and finally explore the stunning scenery at Antelope Canyon. To see photos, ratings, traveler tips, and other tourist information, use the Page road trip planning site . You can drive from Flagstaff to Page in 3 hours. Alternatively, you can take a shuttle; or take a bus. Traveling from Flagstaff in July, you will find days in Page are a bit warmer (98°F), and nights are warmer (73°F). On the 24th (Wed), you'll have the morning to explore before heading back home.